(NaturalNews) Thank you to all those who voted in our Natural News 2016 Presidential poll! Donald Trump easily dominated the top spot, more than doubling the support for our second-place candidate, Rand Paul. What's truly astonishing to me -- and pleasantly surprising -- is that 97.9% of our readers rejected the two establishment candidates: Hillary Clinton and Jeb Bush. Bush got the fewest votes of all: just 0.6%, even losing out to "no answer" votes! Hillary Clinton received an embarrassing 1.5% of the votes, indicating that Natural News readers are, indeed, well informed on the runaway criminality of the Clinton regime. 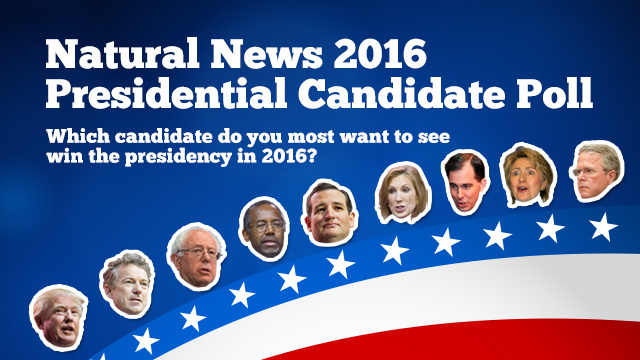 All the top vote choices for Natural News readers -- Donald Trump, Rand Paul and Bernie Sanders -- are anti-establishment candidates at some level. Rand Paul, for example, openly opposes the totalitarian police state in America, and Bernie Sanders openly opposes the Wall Street bankster criminality that dominates our financial sector. 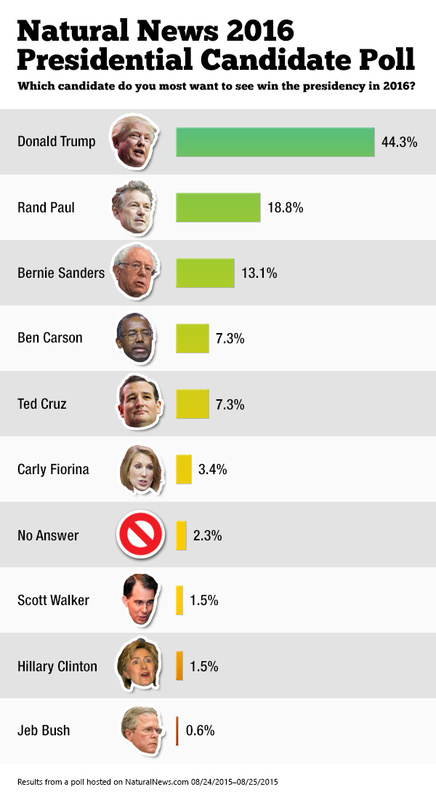 As this poll reflects, people in America are sick and tired of the status quo in Washington. They're sick of the corruption, the tyranny, the lies, the pandering, the wasteful spending and the targeting of patriotic Americans by the IRS and other federal agencies. They want REAL change, and Donald Trump is the guy they see as being able to march into Washington and clean house. It's no coincidence that we acquired the domain Trump.news, where you can read real-time breaking news on Donald Trump every hour of the day. See FETCH.news for breaking news on other topics such as Hillary Clinton or the White House. Thank you for participating in our 2016 Presidential candidates survey! We'll re-run this survey in a few months to see where things might have shifted by then. It seems increasingly likely that Hillary Clinton will be out of the race by that time. By the way, I'm fully aware of the many Natural News readers who say this entire election is a charade, and that the powers that be will never allow Trump to become President because he would tear down too much of the corruption that's keeping all the bureaucrats in power. You may be right about that, but for the moment, I'm willing to give Donald Trump the benefit of the doubt and see how this plays out. One thing you might be forgetting on this point, by the way, is that Donald Trump is pro military, and the Pentagon has desperately wanted to replace Obama with someone who actually gives a damn about veterans and national defense.